I think it is safe to say that the way we celebrate Christmas here in Australia is very unique. For starters, it is summer time here and the temperature can vary from between 15 and 40 degrees. So here are just a few ways that we celebrate an Aussie Christmas. While many of us still cook a traditional hot dinner, lots of us opt for something cold like seafood. We also have a very laid back kind of lifestyle here so it is not unusual to see lots of us celebrate the day by going camping or to the beach. December is a very popular time of year for visitors to Australia. 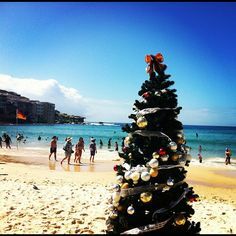 Bondi Beach in Sydney is a hugely popular spot for backpackers and locals to spend Christmas Day. Come to think of it pretty much any beach is a popular spot to be, especially if it is a very warm day. Australia is a big country which means that sometimes our family and friends are spread far and wide. But that’s okay. We are a sociable bunch and will often invite people we have just met to join us for Christmas. This is especially true if you are camping. Food wise, we have the luxury here in Australia of access to some of the freshest and best seafood anywhere in the world. 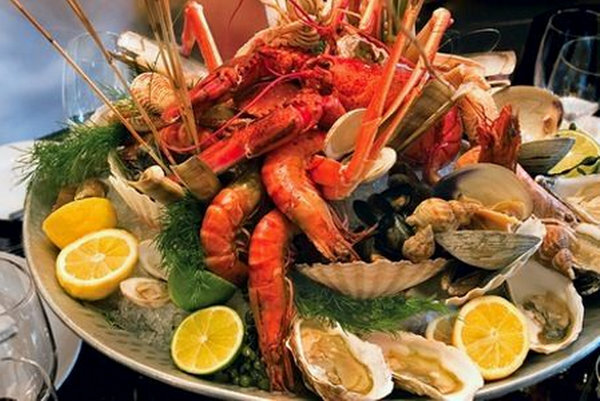 Therefore seafood often features heavily on our Christmas day menu. If you happen to be camping then maybe your Christmas dinner will look something like this…. I would be more than happy with this feast for my Christmas Day dinner. And no Aussie Christmas is ever complete without trifle…..that’s if you are lucky enough to get any! I’m not sure if Miss M’s spoon is big enough! Finally you just can’t go past decorating your house with masses of Christmas lights. It has become so popular here in Australia that there are competitions for the best decorated house. We have a family tradition where we drive around on Christmas Eve to look at them all. Sometimes the whole of one street will get involved. Many people spend thousands of dollars to achieve the look they want. 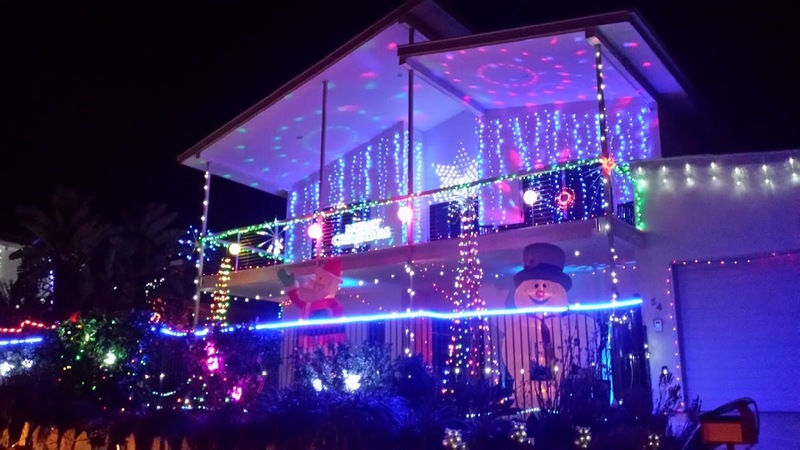 This house on the Gold Coast has a dazzling display of Christmas lights. As Christmas 2015 draws to an end Brenden and I would like to thank you all for your support this year. We hope you have enjoyed your day where ever you may be and we look forward to continuing to share our travels with you in 2016. I love all of these Aussie Christmas traditions, particularly the trifle! You wouldn’t want to live anywhere else would you?